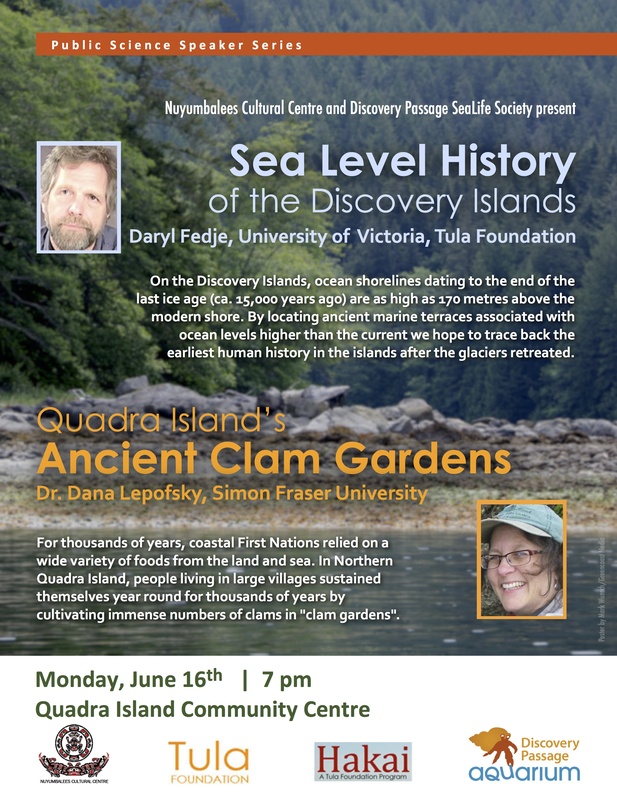 Friends of this blog Daryl Fedje (UVic) and Dana Lepofsky (SFU) will be presenting on their Tula-funded archaeological research which is unfolding up on Quadra. Tula funds an incredible variety of worthwhile projects around the world but locally these have been concentrated out of the Hakai Beach Institute. However, a new focus of Tula-funded research is emerging on Quadra Island focused around the Discovery Islands (specifically, Quadra, Read and Maurelle Islands). An archaeology lab has been built there as part of the emerging Field Station, and a multi year project directed by Daryl will be investigating the Pleistocene-Holocene transition via paleo-environmental reconstruction and archaeological survey and excavation. This project is in its first year but already there are some great new data points for sea level reconstruction which will be tremendously useful in guiding archaeological survey and interpretation. Dana’s work, together with biologist Anne Salomon, has been going on for a few years now, with a focus on “clam gardens” on North Quadra island, which are numerous and increasingly well-understood. It was these features which provided focus for the recent high-profile paper in PLOS-1 by Dana and Anne’s student Amy Groesbeck et al. More on that here and here – I ought to do a post on this exciting research alone. Anyway, if you live on Quadra Island, or even in Campbell River, Courtenay or Comox, it might be worth an evening out to catch these interesting talks. This entry was posted in Archaeology, Northwest Coast, Vancouver Island and tagged aquaculture, Archaeology, Campbell River, clam gardens, clams, Discovery Islands, mariculture, Quadra Island, sea level history, SFU, shellfish, uvic. Bookmark the permalink. If relative sea level was 170 m higher 15,000 years ago, where was the ice that was depressing the crust that much? Immediately overtop of the Discovery Islands? On the mainland, or both? Your question was asked, Mad Dog, in a sneak preview before over 100 (!!) people turned up for the talk. 15,000 radiocarbon years ago (18,000+ calendar years) the area was covered in ice. But by 15,000 calendar years ago (12,000 radiocarbon) the area was largely ice free and available for any people that might be in the area – even Vancouver Island was in an advanced state of deglaciation. Locally the oldest sites in the Salish Sea are Manis Mastodon and Ayer Pond at about 13,750 calendar years. So it is plausible to see people in a local, ice-free area at 14,000 years ago – at which point the sea level was over 150 metres higher than today. 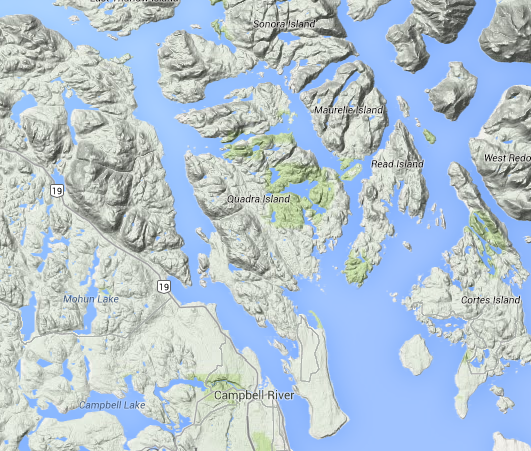 I’ll see if I can get Daryl’s picture of the reconstruction of Quadra Island shorelines through time, it’s impressive to see Quadra, Read and Maurelle as a cluster of archipelagos that then coalesce into today’s landscape of large blocky islands. Per our paper in the Madsen volume “Entering America”, these early archipelagos might act as “staging areas” (see Anderson and Gillam 2000) for first peopling of the coast since they have the locational advantages of densely packed coastal ecotone and the ensuent resources. They might therefore have been “safe haven” high-resource areas during landscape learning / first peopling. two data heavy (very tippy canoe) papers related to this topic of discussion just came out, sorry for the paywall links but if you email the authors directly they might just send you pdfs on demand, congrats to Duncan /Daryl and crew of paleosciency sea level folk! McLaren, Duncan, Daryl W. Fedje, Murray B. Hay, Quentin Mackie, Ian J. Walker, Dan H. Shugar, Jordan B.R. 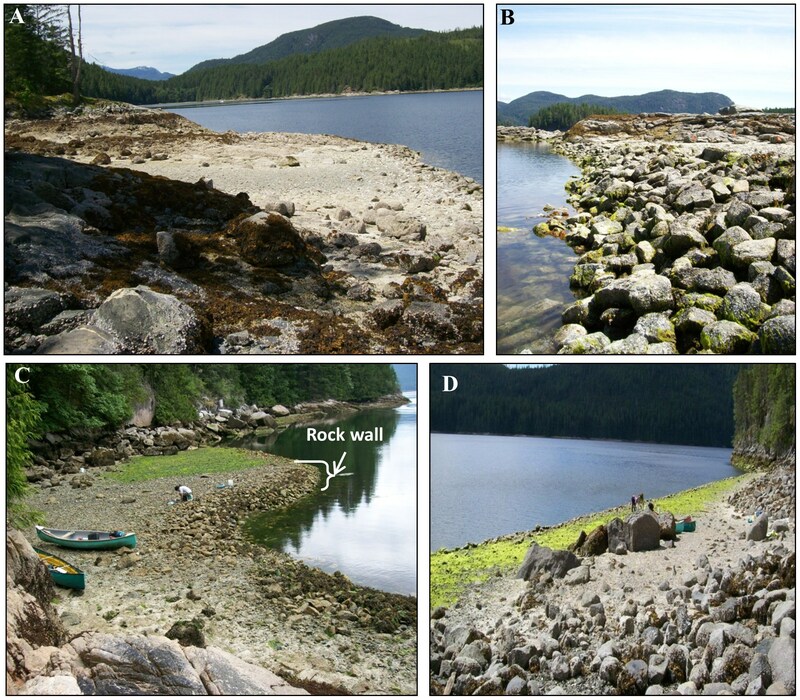 Eamer, Olav B. Lian and Christina Neudorf (2014) A post-glacial sea level hinge on the central Pacific coast of Canada. Quaternary Science Reviews. Shugar, Dan H., Ian J. Walker, Olav B. Lian, Jordan B.R. Eamer, Christina Neudorf, Duncan McLaren and Daryl W. Fedje (2014) Post-glacial sea-level change along the Pacific coast of North America. Quaternary Science Reviews. Thanks, two eyes! Those are fantastic papers.